Succulent Korean BBQ Short Ribs are easy to make and grill up in minutes. They have a rich meaty flavor very different from American style BBQ ribs. Everything changes when you get married. Some of it is sudden and a little shocking. (I had no idea he was going to take my blankets, my pillows and then try to sleep on top of me every night.) Some of it is a wonderful gradual shift into an entirely new way of doing life as a couple. Looking back four years to when Jon and I started dating I see we have undergone a dramatic change in the way we eat. It didn’t happen overnight. Instead it was a slow evolution of two people finding a way to be that honored the other’s needs and likes. Before Jonathan, I rarely ate any Asian food. When we got engaged I realized right away that without Jon’s mom or Aunts close by he was never going to get any Korean home cooking unless I (the white girl) did it. So the adventure began. I learned from my husband, from cooking blogs, from my new mother-in-law. I experimented and I took strange shopping lists to the very patient Mr. Hong at the Korean store. Of all the amazing Korean dishes I now cook, Garbi is one of my absolute favorites. There is no standard spelling in the English language for the dish but the three main variations are Kalbi, Galbi or Garbi. However you spell it these beef ribs are downright amazing. The marinade is simple and combines the magic flavors of ginger and soy sauce with some green onion and spices. The meat is rich and succulent. I serve it over a bed of white rice – really that is a must for capturing all the delicious juices and sauce from the meat, but it is also good with some veggies. The dipping sauce is less traditional but I enjoy serving it along with the meat. If you have not seen this type of meat at your favorite grocery store ask the meat department if they carry it or can cut it. I find that Asian stores that sell meat almost always carry it and sometimes have the best price too. Supermarkets that employ a butcher are likely to have some on hand from time to time or be able to cut it for you. Sometimes the cuts are extremely fatty. I look for cuts where the meat is marbled with some fat along the edge but not so much fat that it almost looks like bacon. When I do find a sale on good pieces I stock the freezer. I find that three pounds serves four people very comfortably but if I was making dinner for Jon and his brothers I would plan on about two pounds per boy. Those boys can put away the Garbi! If you have never made any Asian food before Garbi is the perfect dish to start with. It is easy, delicious, not spicy and a reliable family pleaser. Kids love it and it is a great way to introduce them to an authentic dish from another country that they will actually enjoy eating. Put everything but the meat into a Ziploc bag. Seal the bag and shake to mix all ingredients. Add the meat and refrigerate 1-3 days. If you plan to make the dipping sauce this is the perfect time to start it so the flavors can develop. About two hours before you want to cook it, set the bag of marinated meat on the counter and allow it to come to room temperature. The meat can be cooked on a grill or in a frying pan if a grill is not available. A grill will give a better flavor. To grill the ribs preheat a BBQ to high heat. When it is good and hot, add the meat and cook for 1-2 minutes / side allowing good char marks to establish. Continue to cook the meat for a few more minutes turning frequently until it is as cooked as you desired. I recommend medium-rare. To pan fry heat a cast iron or nonstick skillet to medium-high heat. Using enough oil to make sure the meat does not stick, cook turning frequently until the meat is as cooked as you desire. I recommend medium-rare. Stir all the sauce ingredients together and refrigerate until you are ready to use. The sauce is best if it as had at least 12 hours to develop. Leftover sauce keeps indefinitely in the refrigerator but will become very strong after a few months. We prize leftover sauce as a condiment for stir fry, a dip for almost any Asian food, and particularly for pot stickers. When I find a sale on the ribs I make up the several batches of Garbi for the freezer. I put the meat in the marinade and then freeze it in Ziploc bags until I need a quick and easy dinner. I love doing the work of making the marinade once and having it ready for a quick dinner when I need it. As a bonus it defrosts quickly. Prepared food homemade style! 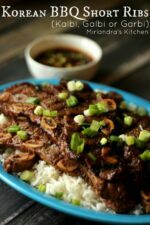 I just made your Korean short rib Kalbi beef recipe and it was AMAZING!!!! I’m married to a very white guy that is completely in love with Korean food. We live in Naples FL and there are no Korean restaurants here. The closest is a 2 hour drive away, but don’t think we haven’t made that trip more than once. Lol. His favorite however, is pork bulgogi. I was hoping to find it on your website. Because I did not, my husband asked me to email you to see if you can help and Since your ribs recipe taste exactly like it does at our favorite restaurant I’m sure your pork bulgogi will as well. Thank so much and feel free to post this as I’ve been bragging to everyone about you and I’m going to try your other recipes as well!!! Hi Marie – Sorry to be SO long in getting back to you! We have had some family stuff going on and I am just getting back to comments and e-mails now. I am thrilled that you enjoy this so much! It is one of my all time favorite Korean foods. Are you looking for a recipe for pork bulgogi with the spicy red sauce? Sometimes it is called “dedgi bulgogi” I think. Or did you have something different in mind? If you are doing a lot of Korean cooking at home I think that Holly at Beyond Kimchee has some really helpful stuff. She might be a good resource for you (https://www.beyondkimchee.com/). Also stay posted in the next few weeks. I have a post in the works on making Kimchee at home the way my mother in law taught me. Thank you so much! I love this one. I’m actually getting ready to make a video of it to share on the post too. We could eat this every week!